We know you have many choices when choosing a Dentist in McLean, VA so we have made requesting an appointment a simple process via our Web site. If, for any reason you cannot keep a scheduled appointment, or will be delayed, please call us as soon as possible. McLean Dental Care will file your insurance claims electronically on your behalf as a courtesy. However, we are not a participating provider with dental insurance programs. Treatment is provided on a fee-for-service basis. We accept cash, checks and all major credit cards. For those who need a more flexible payment option, we offer a third payment plan through Care Credit. Please contact our financial coordinator for details. DIAGNOdent laser technology allows us to identify cavities early when they’re still easy to treat. 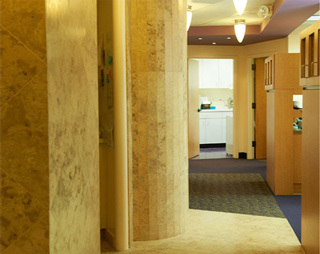 The system utilizes fluorescent technology to find hidden cavities other methods can overlook. It utilizes a Diode laser which can be used for treating gum issues, tooth sensitivity and TMJ pain. For small cavities, you may be able to enjoy the comfort and quiet of being treated with air abrasion, an alternative to the drill. An air stream of tiny aluminum oxide particles gently removes decay without the discomfort of an injection or the drill. Air abrasion is also used routinely to enhance the adhesion of restorations to the teeth. Our digital X-ray system ensures you and your family are exposed to less radiation and less waiting as images are available immediately. In 2012 we updated the system so now our X-rays have even a better quality of view, are quicker, and have even less radiation for the patient. We’re also able to enhance any special areas of concern for added accuracy in diagnosis. In addition, because we’re aware of our patients’ requests for fewer X-rays, we take only what we deem necessary for proper diagnosis based on each individual.